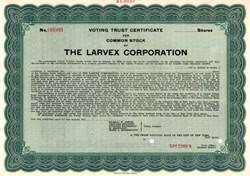 Beautifully engraved SPECIMEN certificate from the Larvex Corporation. This historic document was printed by the American Banknote Company in 1925 and has an ornate border around it. The company had a patent regarding ....the presence of fluorine, silicon and aluminum characterize the treated materials...a moth-repellant composition comprising water soluble compounds of fluorine, silicon and aluminum...as an insecticide for prevention of malaria.